This poem moved me so deeply that I followed up with a Google search and found that Dawna Markova had written a book by the same title. “Why are we here?” is the question she asks both herself and the reader of this wonderful book ~ I WILL NOT DIE AN UNLIVED LIFE ~. It’s written while Dawna is on a retreat to solitude in a cabin far away from the hectic pace of modern life. Her story travels along different paths than mine has and that’s the whole point of her book. We’re here to follow our own passion and dreams. Anne Morrow Lindbergh’s book ~ GIFT FROM THE SEA ~ was shared with me by my mother back in the 90’s. I packed myself a lunch and took a ride to the beach, setting up my chair in front of the ocean. It was a restful day that I needed badly and I hoped to find nuggets of wisdom and truth from this book. At the time it was difficult for me to concentrate on it. I kept thinking ‘How can this wealthy woman whose life is so different than mine even relate to what I’m experiencing?’ It’s only been down through the years and coming across Anne’s various quotes from her book that I’ve decided to read it again. Dawna Markova read it to inspire her book ‘I Will Not Live An Unlived Life’ and I decided to read them both this summer. I was so inspired by what Francis wrote in his guest blog that I bought his book on Amazon Kindle and I’ve just begun reading it. His story begins with his life as a 15 year old young man in the African country of Sierra Leone and in the heart of the African diamond zone. His story too is a spiritual journey of trust in goodness in the world in spite of the hardships and realities that might come along. It’s his trust in this goodness that makes it possible for Francis to be fully present when God opens a door in his life that leads him to the path of his dreams. I remember when I first read this quote and for the first time thought about my life in terms of being a journey. It helped me to let go and not worry so much about outcomes and more about observing myself in the present moment. Where was I on this journey? What steps could I take that would move me along on this journey? Thinking of my life as a journey, and not a destination, helped me to look more within instead of seeking the answers from others. ARRIVAL ~ I’ve arrived at a place where looking back on the good and the bad along the way brings me a sense of peace and contentment. I recognize the girl, daughter, sister, woman, wife, mother, aunt, grandmother and friend who traveled down these paths to be a strong human being who had her own sense of self always at the core of her life. A human being who decided to face life’s challenges with an attitude of hope and perseverance. It’s good to look back and to see that you’ve arrived at a good place in spite of those times of self-doubt and wavering. always within you but hidden before. Look back on your life as the story of you. Look forward to new adventures. You’ve worked hard and prepared the way for some of the best days of your life. In 1995, two flight attendants looking for a travel companion that would be stylish with many pockets, founded Baggalini. Baggalini Crossbody Travel Bags make it easier to move from place to place with a sense of safety and security while keeping everything you need at your fingertips and in its place. Just what I was looking for when I set out on my first foreign trip to England in 2001. This bag, tucked away on the top shelf in my closet, has since been my travel companion on many exciting and happy memories. It seemed to be the perfect choice for this week’s writing assignment ~ ‘Write about an item in your closet that you still use and holds many memories.’ Foreign travel to the Middle East and Ireland were trips of a lifetime. Air travel to see family in Arizona, Ohio and Vermont were made easier with this little bag, especially when I had mobility issues with the onset of age-related medical problems. There was a time when I thought the opportunity to travel by air would never happen for me and my Baggalini reminds me that dreams do come true no matter how old you are. It will remain on the top shelf of my closet, within my reach, for those spontaneous moments when the chance to travel becomes a reality once again. Life is a Journey! It’s FlashBack Friday ~ A time of the month where you can republish an old post of yours that maybe didn’t get enough attention, or that you’re really proud of, or you think is still relevant etc. This Blog-Go-Round is hosted by Jemima Pett and originally introduced by Michael D’Agostino from A LIFE EXAMINED. That’s where you’ll find the rest of the participants or to join up yourself. The post I’ve chosen for this month first appeared on ME IN THE MIDDLE on March 21, 2016. Last April was a month of non-stop blogging and commenting even though I had pre-scheduled most of my alphabet posts. I was seeing alphabet letters in my sleep and would wake up early in the morning to make sure my day’s post was delivered as scheduled. The many blogger friends that I’d meet each morning became my little blogging community as we encouraged each other and praised each other for the amazing ideas picked for themes. This year I really will miss this part of the Challenge. 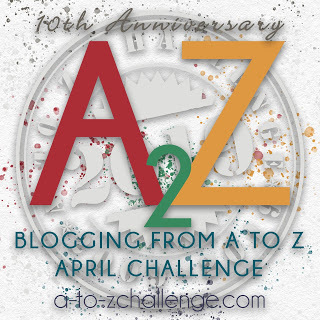 I’ll still be visiting A to Z Bloggers and hoping that I’ll continue to make new friends. All 26 posts for the A to Z Blog Challenge, along with the comments, can be seen by clicking HERE ~ or by clicking on the Title below.